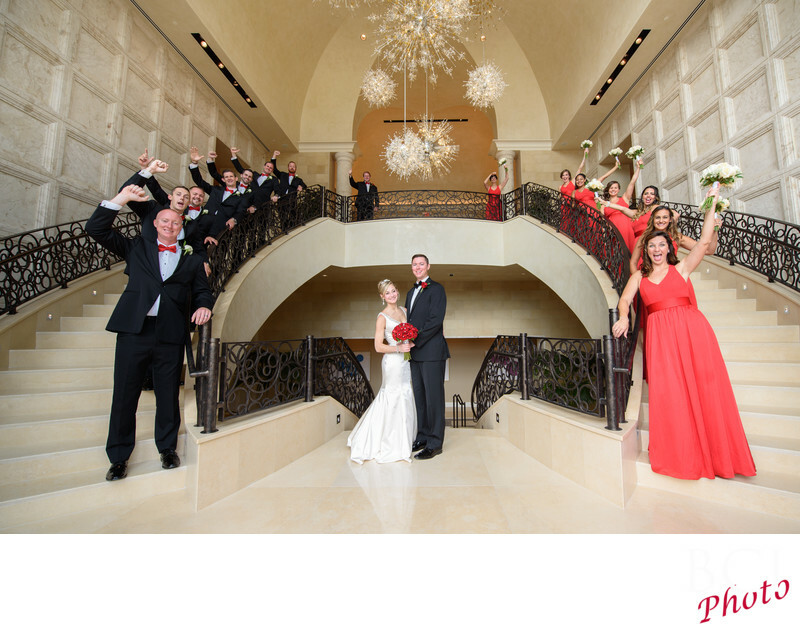 Seriously though we had a blast setting this shot up on the amazing staircase entrance at the fabulous four seasons disney resort in orlando florida. We also are lighting them up subtly from each side, and shooting through the open doorway in order to get them all in. All in all it was totally worth it! Way to go guys! Thanks for helping us out! We take capturing your romantic wedding portraits very seriously, and in fact this is our absolute favorite part of your wedding day.Sadly, it also seems to be the one place during your day that wedding planners and coordinators fail to allow enough time for when creating an effective timeline.Or, even worse…trying to cut out on the wedding day in order to catch up from the earlier parts of the day running behind.We HIGHLY recommend, building in a little extra time along the way to avoid this, and to allow you enough time to capture these most important and memorable images without being unduly rushed. Also, it’s during this 30 minutes or so, where most photographers really struggle.A lot of the time these are done outdoors.Which means, either they blow out the skies to get the faces right…or worse.This however, is where we shine.We are experts at using not only natural light for all its worth, but also supremely adept at augmenting the existing light with our dynamic outdoor portable lighting which allows us to create imagery that mirrors the way the eye sees.So that means not only will the two of you be exposed properly, but you’ll also find the background, skies, water, clouds all look just as they did on your wedding day (or even better)!This is only achievable by using off camera lighting techniques that allow us to balance the natural light with our own.The resulting images are simply and completely superior to those possible by most studios.You deserve better.That’s why you are here. When we create your wedding album design, typically the most space in the album, and of course the album cover itself are going to come from this part of the days shooting..To us, your wedding album should flow and tell the story of your day.As such, following the detail page, the order of events will follow the same order in the book as it occurred throughout your day.